What a wild ride “The Catalyst” has become! 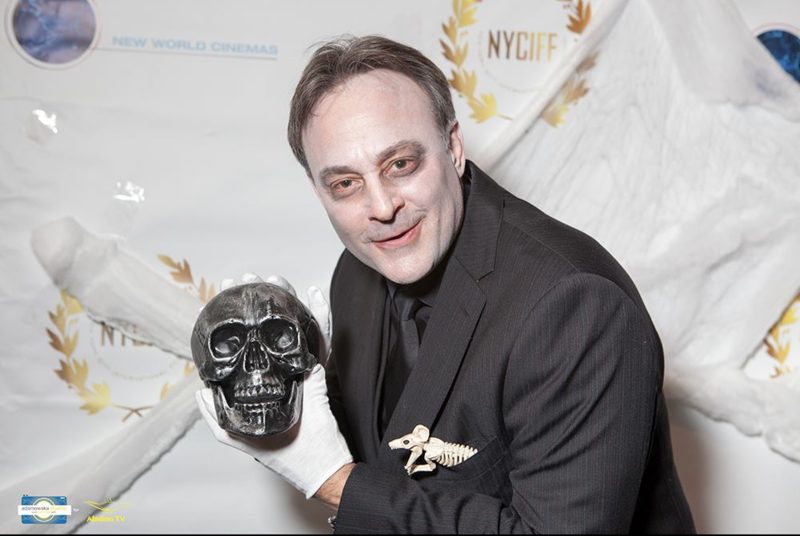 I have to pinch myself to believe that I am typing this entry while on a plane to Los Angeles and our third film festival since October 1st. Actually, I didn’t finish writing this on that plane ride. 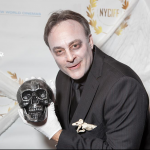 I’m continuing now on my way back to NY, having increased our four awards with three more, and off to attend the New York Short Film Festival in Greenwich Village. In keeping with our slogan, “good is more important that fast,” post-production on our project inched along until September. 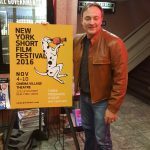 When the final touches were in place, maybe even a little before, I started applying to film festivals. I had no idea how the festival system worked, but soon found out. Before the internet, it must have been far more difficult to apply. Now it is as easy as buying my plane tickets to LA. There are a number of websites to assist filmmakers. I am aware of two: FilmFreeway.com and WithoutABox.com. I used the latter, but the premise seems the same; in fact, it is probably the same as computer dating. You set up a profile and try to make it look as good as possible for suitors. You include details, pictures and a cover letter. Then you decide how you want the judges to view your actual film. The choice is either Vimeo.com or IMDB.com, the Internet Movie Database, which seems to own or be affiliated with WithoutABox. I tried both, but found the video quality, password protection and the ability to replace the film with updates and finishing touches better at Vimeo. I just watched the end titles on my laptop, and if I remove any traditional redundancies, there were 76 individual thank yous and I STILL wonder if anyone is missing. I knew that credits and thank yous would be a big issue, but I was not ready for the unintentional animosity they could create. I was scolded by two people who abandoned “The Catalyst” for various legitimate reasons (they accepted other opportunities), yet both felt they still deserved at least a thank you credit for all the work they did, even though none of it actually helped move us forward and much of it wasn’t obvious to me. I initially thought when someone abandons you, you are no longer obligated to them, but since this has happened more than once, I have to conclude that thank yous are either mandatory for even slight involvement or I am a pushover. Regardless, I added them both to the credits. It didn’t cost anything and I did learn from those people. 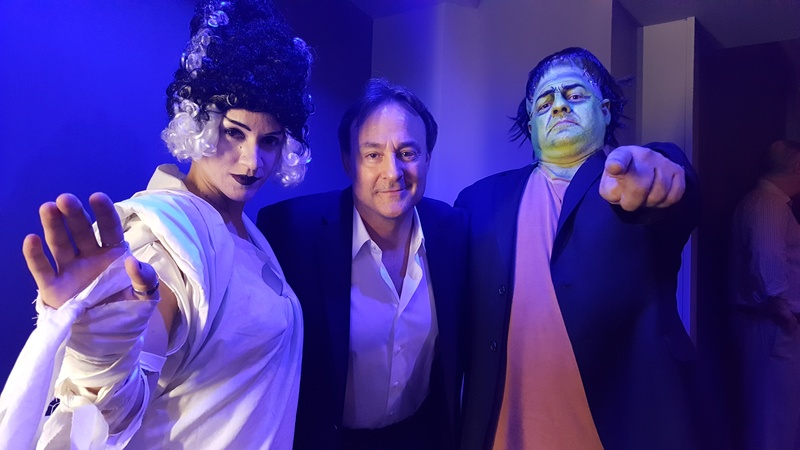 But there is more… While I am happy to refer and connect individuals for the sheer joy of helping, in show business , people expect credit for doing that, if not money and so I was shamed into adding to the credits yet again. And finally, this wasn’t a credit issue, but a sticky one nonetheless… I initially cast a truly terrific actress in the lead roll, one who I still hope to work with someday, but then my thinking changed about the character and we recast, but the hard feelings were brutal when I met this actress again at a festival. Instead of taking the high road, she made me squirm, repeatedly, which I did not appreciate. I really love her talent, and for the right role, she would be great, but in the meantime, she has me scared! These bumps in the road caught me off guard. For those of you who know me, I have a need to make everyone happy. I’m devastated when I hurt people’s feelings. There was a time during this process that I felt I was ONLY hurting people’s feelings and I was pretty depressed. As you can imagine, I’m a little gun shy now. As I mature as a filmmaker and get deeper into the business, I will probably uncover more of these interpersonal “gotchas” and I’m not looking forward to that part of the process. I am hoping to get enough good people around me to either protect me from doing that again, or understand and forgive me when I do. Festivals can be costly. Their fees range from $25 to $75 or more, and then go up as you get closer to their start date. Go to more than a handful and those fees can add up. Plus there are the costs of travel and lodging. 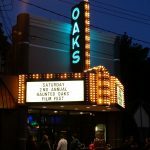 Many filmmakers make the mistake of not leaving enough money in the budget to cover festival costs, but it is hard not to spend on your film if it isn’t finished yet. In our case, we had a little left, but we also raised a little more too. By the end of September, we were starting to hear from festivals. First, you become an Official Selection, then on the final night, Award Night, you learn if you received any additional honors. 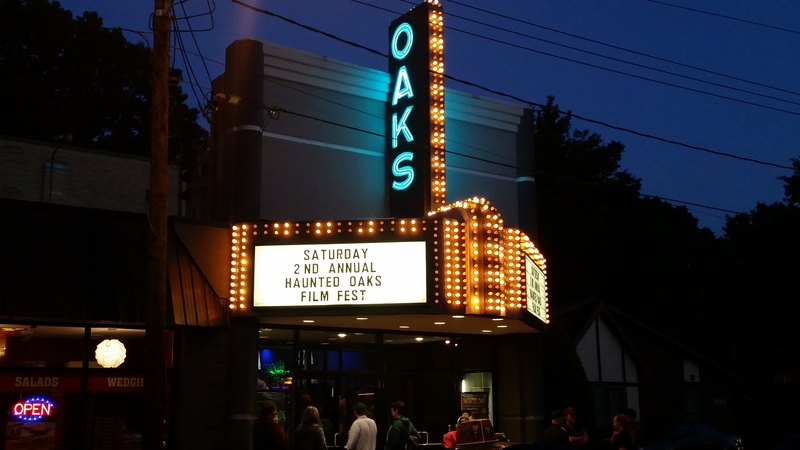 I was very excited on October 1st as I loaded up my car to drive to our first film festival, the Haunted Oaks Film Festival in Pittsburg, PA, a vibrant filmmaking community and the shooting location for arguably the granddaddy of all indie genre films, “The Night of the Living Dead.” The Oaks Theater was beautiful and handsomely decked out . 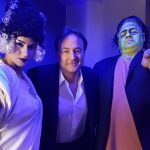 I met my hosts, most notably Ruthy Draper, Lance Parkin, Jess Paul and David Ogrodowski. 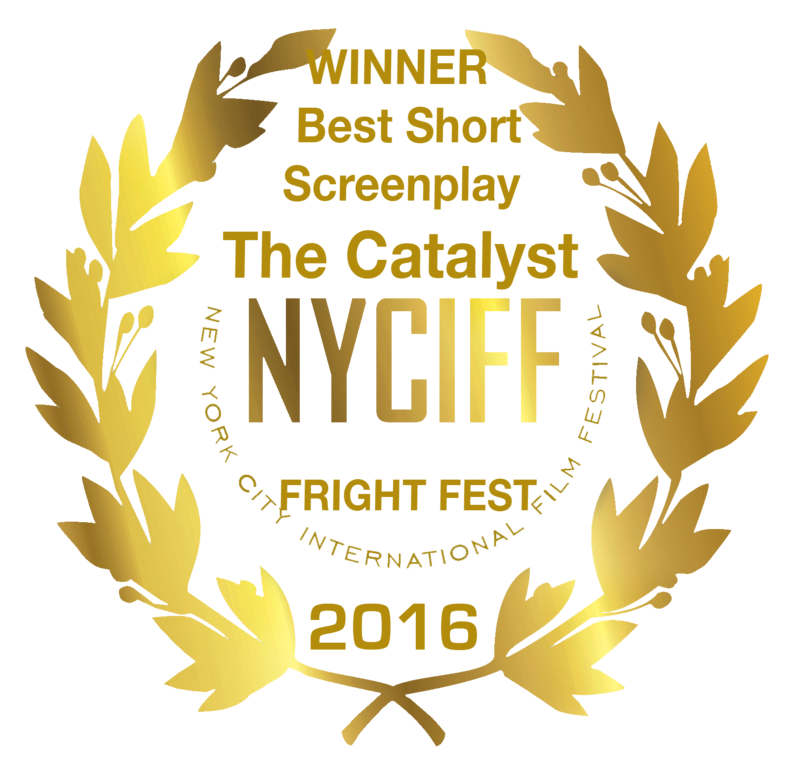 More recently on Halloween, “The Catalyst” won Best Short Screenplay at the New York International Film Festival’s Fright Fest in the Dolby Theater on 6th Avenue in Midtown, where our hosts were Roberto Rizzo, Caroline Ingeborg Johnson and Joe E. Goodavage. 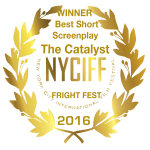 As mentioned, I am now on a plane, flying back to NY from Los Angeles, where “The Catalyst” was an Official Selection of the Zed Fest Film Festival in North Hollywood. There we won awards for Most Outstanding Special Effects (our second for that) and also Most Outstanding Actor and Actress for Kristopher Cusick and Sarah Wilson. 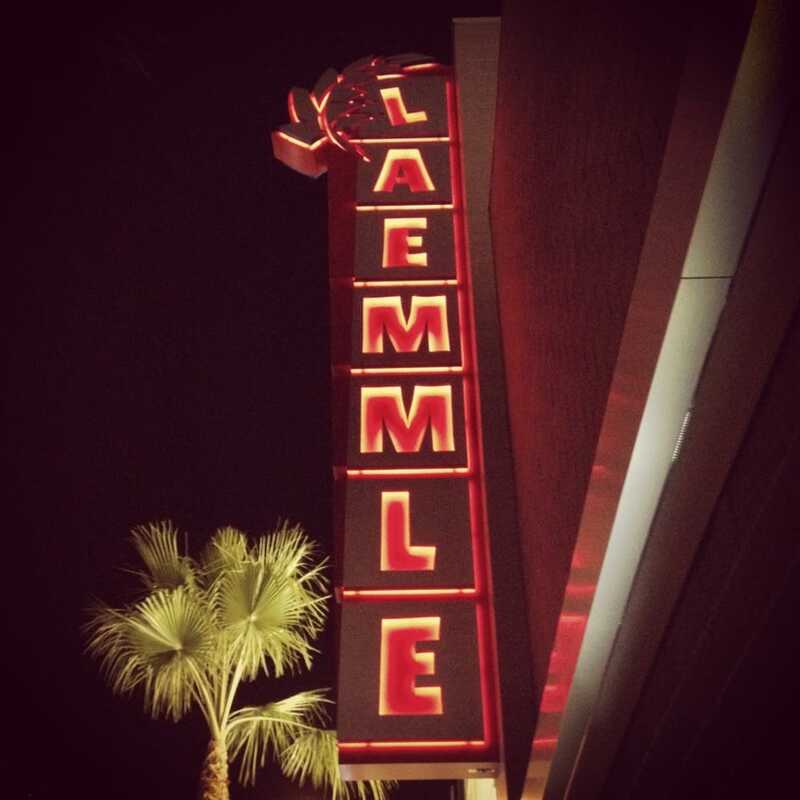 While out West, I corresponded with three companies about “The Catalyst “ feature film, but once in LA, two did not return emails or phone calls. One did, and its President/CEO and I will continue our discussions once I’m back home. I will reveal more about these discussions in future blogs if they pan out and become more substantial. We are waiting to hear from more festivals, but we already know about one in December and another in February. 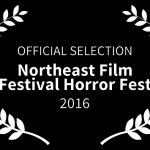 “The Catalyst” will be an Official Selection of The Northeast Film Festival Horror Fest. They received an overwhelming number of submissions and could only accept 10% of which we are a part. 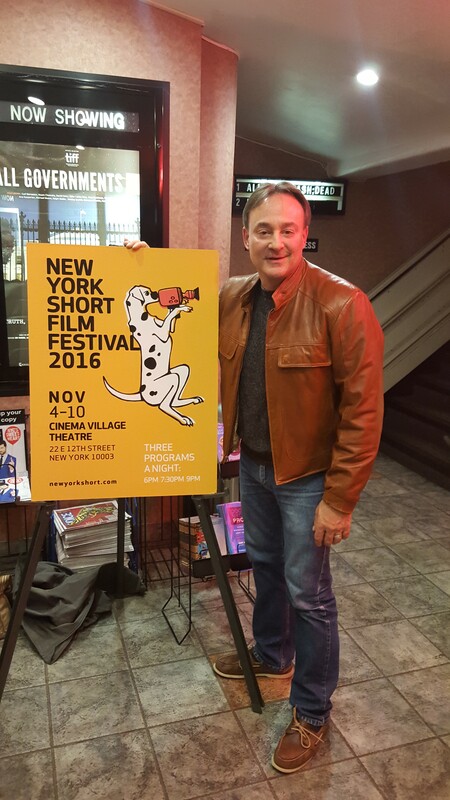 This year’s festival will take place at the Teaneck Cinemas, December 7, 2016 and December 8, 2016. Both days begin at 6pm. 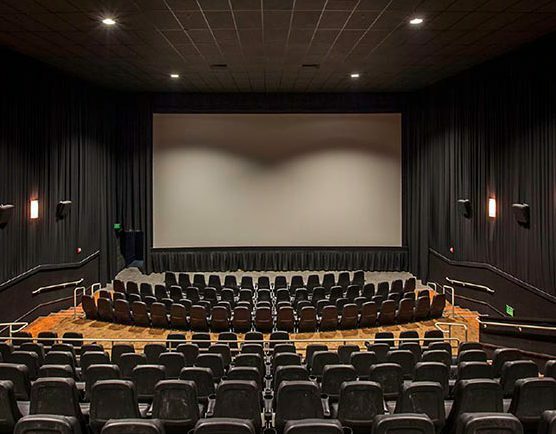 The theater is located at 503 Cedar Ln, Teaneck, NJ 07666. 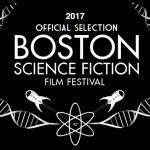 “The Catalyst” will also be an Official Selection of the oldest genre film festival in the country, the 42nd Boston Science Fiction Film Festival and Marathon at the Somerville Theater, Feburary 10-20, 2017. 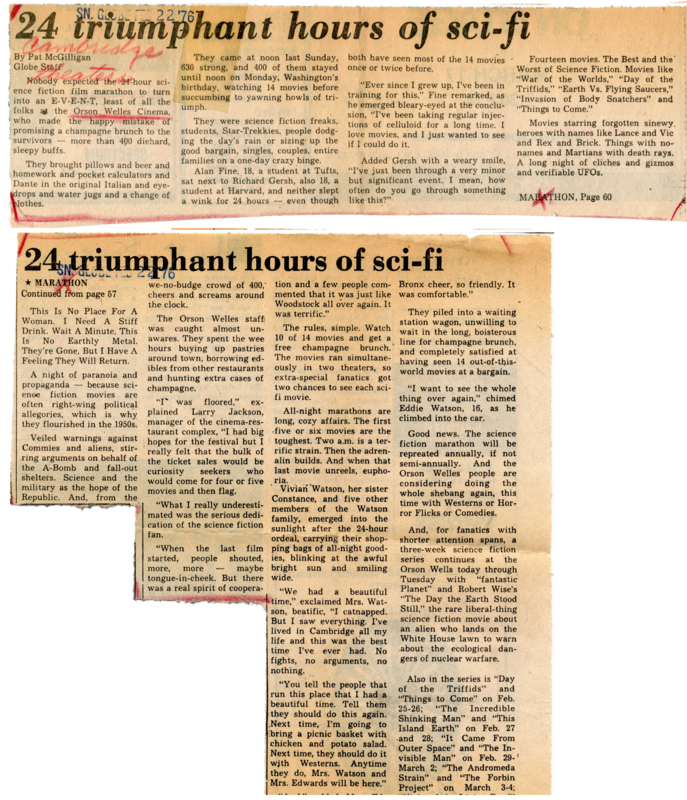 This event is close to my heart, because it turns out I was at the very first one in the legendary Orson Wells Theater in Cambridge (before it burned down), and have the Boston Globe article to prove it! (See below.) Garen Daly, the Festival Director said I would be joining Director Darren Aronovsky (Noah, The Wrestler, Requiem for a Dream) as someone who went to the festival in their youth and came back with a selected film. 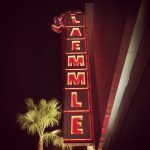 Garen is making a documentary about the Orson Wells Theater, because it was a very special place for film lovers, and because Tommy Lee Jones was an usher and Martin Scorsese ran the projector. They were both interviewed already, and in February, I will be too! I’m starting to think all the time and hard work spent on “The Catalyst” were worth it. I’m starting to… I mean, it was a lot of time and hard work! As should be painfully obvious by now, I can’t thank everyone enough, and I won’t stop trying. PS. You can see a short 30 second teaser of “The Catalyst” at the bottom of the welcome page of our site at www.CatalystGhostStories.com. It is so much fun telling you what’s happening. You are a great supporter. OMG ! Alan , I am so impressed ! Good for you ! What an amazing ride ! All the best to you ! So good to hear from you. Thank you for taking the time to write. And I’m always impressed with you, so the feeling is mutual. Congratulations! I’m proud of you ! Mr. Sav, we need to find a way for you to see this film, because your name is in part of the dialogue. When the mother character asks the father character how many teachers are supervising a school trip, the father’s list includes all the teachers who formed me, and you are on that list. Allow me to be a spokesperson for all your students when I say, “Thank you.” Email me please when you get the chance. And please send love to your family. So sweet of you to write. Hope all is going well for you. Looking forward to catching up sometime. What I’ve been through is the tip of the iceberg. Next it starts getting harder!